Sulphur is the most abundant and widely distributed element in the nature and found both in free as well as combined states. Sulphur, like nitrogen is an essential element for all living systems. In the soil, sulphur is in the organic form (sulphur containing amino acids-cystine, methionine, proteins, polypeptides, biotin, thiamine etc) which is metabolized by soil microorganisms to make it available in an inorganic form (sulphur, sulphates, sulphite, thiosulphale, etc) for plant nutrition. Of the total sulphur present is soil only 10-15% is in the inorganic form (sulphate) and about 75-90 % is in organic form. Cycling of sulphur is similar to that of nitrogen. Transformation / cycling of sulphur between organic and elemental states and between oxidized and reduced states is brought about by various microorganisms, specially bacteria- Thus “the conversion of organically bound sulphur to the inorganic state by microorganisms is termed as mineralization of sulphur". The sulphur / sulphate, thus released are either absorbed by the plants or escapes to the atmosphere in the form of oxides. 1. 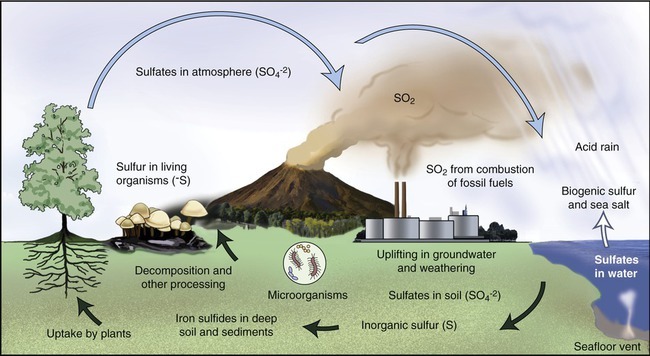 Mineralization: The breakdown / decomposition of large organic sulphur compounds to smaller units and their conversion into inorganic compounds (sulphates) by the microorganisms. The rate of sulphur mineralization is about 1.0 to 10.0 percent / year. 2. Immobilization: Microbial conversion of inorganic sulphur compounds to organic sulphur compounds. 3. Oxidation: Oxidation of elemental sulphur and inorganic sulphur compounds (such as H2S, sulphite and thiosulphale) to sulphate (SO4) is brought about by chemoautotrophic and photosynthetic bacteria. The members of genus Thiobacillus (obligate chemolithotrophic, non photosynthetic) eg, T. ferrooxidans and T. thiooxidans are the main organisms involved in the oxidation of elemental sulphur to sulphates. These are aerobic, non-filamentous, chemosynthetic autotrophs. Other than Thiobacillus, heterotrophic bacteria (Bacillus, Pseudomonas, and Arthrobacter) and fungi(Aspergillus, Penicillium) and some actinomycetes are also reported to oxidize sulphur compounds. Green and purple bacteria (Photolithotrophs) of genera Chlorbium, Chromatium. Rhodopseudomonas are also reported to oxidize sulphur in aquatic environment. i) as it is the anion of strong mineral acid (H2 SO4) can render alkali soils fit for cultivation by correcting soil PH. ii) solubilize inorganic salts containing plant nutrients and thereby increase the level of soluble phosphate, potassium, calcium, magnesium etc. for plant nutrition. 4. Reduction of Sulphate: Sulphate in the soil is assimilated by plants and microorganisms and incorporated into proteins. This is known as "assimilatory sulphate reduction". Sulphate can be reduced to hydrogen sulphide (H2S) by sulphate reducing bacteria (eg. Desulfovibrio andDesulfatomaculum) and may diminish the availability of sulphur for plant nutrition. This is “dissimilatory sulphate reduction” which is not at all desirable from soil fertility and agricultural productivity view point. Dissimilatory sulphate-reduction is favored by the alkaline and anaerobic conditions of soil and sulphates are reduced to hydrogen sulphide. For example, calcium sulphate is attacked under anaerobic condition by the members of the genus Desulfovibrio and Desulfatomaculum to release H2 S.
CaSO4 + 4H2 -----------> Ca (OH)2 + H2S + H2O. Hydrogen sulphide produced by the reduction of sulphate and sulphur containing amino acids decomposition is further oxidized by some species of green and purple phototrophic bacteria(eg. Chlorobium, Chromatium) to release elemental sulphur. The predominant sulphate-reducing bacterial genera in soil are Desulfovibrio, Desulfatomaculumand Desulfomonas. (All obligate anaerobes). Amongst these species Desulfovibrio desulfuricansare most ubiquitous, non-spore forming, obligate anaerobes that reduce sulphates at the rapid rate in waterlogged/flooded soils. While species of Desulfatomaculum are spore-forming, thermophilic obligate anaerobes that reduce sulfates in dryland soils. All sulphate-reducing bacteria excrete an enzyme called “desulfurases” or "bisulfate Reductase". The rate of sulfate reduction in nature is enhanced by increasing water levels (flooding), high organic matter content and increased temperature.